We’re in the thick of summer and feeling the heat. While rising temperatures bring joy in the form of pool days, beach excursions, and general summer revelry, the heat can make sleeping a bit uncomfortable. A few simple changes can help you keep your bedroom comfortable and calming all summer long. Fans do wonders for cooling off a room. If a ceiling fan is not already permanently installed, consider buying a tower fan that can keep you cool and breezy all day and all night. Check out Dyson’s line of fans and find the right fit for your room and your budget. When it comes to the bed in summertime, everything should be lighter and thinner. This is definitely a situation in which less is more. Heavier blankets, duvet covers, and sheets will increase heat in the bed. 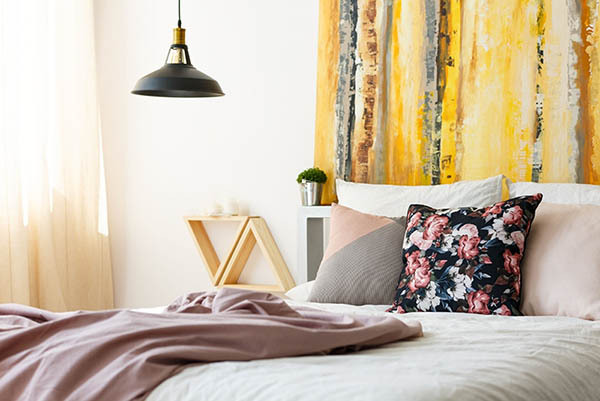 Removing thick blankets and switching to a lighter duvet cover as well as thinner sheets will reduce the potential hot and stuffy nights that arrive with summer. Invest in lightweight California king bedding in lighter colors to help the room look as cool as it feels. The more spacious a room feels, the more relaxing it will be. 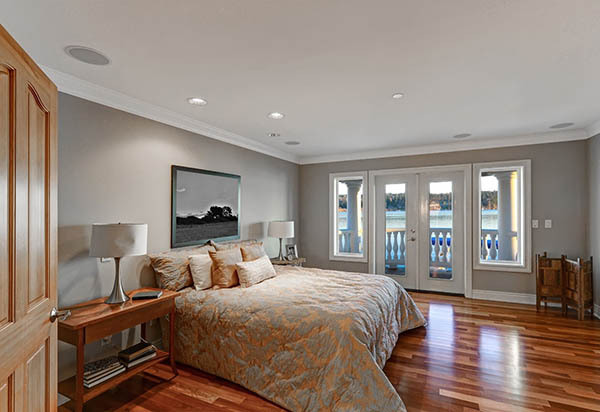 Summer calls for a bit of relaxation, and one way to get more comfort out of your bedroom is to increase the amount of open space available. Peace is promoted by organized, clean spaces with little to no clutter. Nightstands, floors, closets, wardrobes, and dresses must be kept organized —bare if possible—in order to promote a more peaceful atmosphere and state of mind. The simpler the design of the room, the more comfortable it will be. Attempting to add more objects or decorations only decreases open space, so keep your décor to a minimum. The walls of a bedroom play a very important role in your mood and attitude. Whether or not it is summertime, lighter colors tend to promote more relaxation and calmness as opposed to bright colors. Consider painting your walls in a light shade of blue or grey to promote peace. Head to your local Sherwin Williams and grab a few paint swatches for the ultimate bedroom color scheme. When work is stressful, tricking your brain into a state of calm is the key—bring peace back into the bedroom with images that evoke feelings of peace and solitude. You can’t go wrong with scenes in nature. Flowers, trees, sunlight, mountains, the beach, etc. can be very calming, and they can also serve as focal points to guide a viewer’s eye around the room. Plants also increase peace and relaxation. Plants are known to enhance mood and provide health benefits, and there are plenty of different plant species to choose from. Take a trip to your local nursery and talk with the staff about your options; if you have pets, it’s important to look at vegetation and flowers that are non-toxic—especially if Fluffy or Fido decides to snack or your new bedroom plant addition. Make your bedroom more comfortable than ever this summer—regardless of the temperatures outdoors. Keep these tips in mind and turn your sleeping space into a relaxing haven that promotes peace of mind all year long.